Cornis is the leading technology provider for blade O&M data management. We help you with the post processing, reporting and storage of any blade data so you can take concrete O&M decisions and follow you blades all along their life-cycle. Among the various inspections methods, drone-based solutions are relevant solutions are they are quick, they allow a close-up view of the blades and yet remain a remote option. But just like any other data acquisition methods, drone inspections need to be completed by an efficient post processing and reporting system. Indeed, - OEM and utilities want good quality pictures that they can easily reach, classify, extract, share with partners, and compare on the long run. - Drone companies want to ensure maximum satisfaction to clients: OEMs, utilities, ISP. Once Cornis collect the drone data, we therefore handle all the post processing and reporting phase. In other words, we stitch the pictures together and enhance the quality of the blades pictures so there is a uniformed quality from the hub to the tip of the blade and we integrate those data into Cornis blade manager web platform so clients can review their blades directly online. Once the expertise is done, clients are then able to generate reports, make comparison between past external inspections, photographic inspections, internal inspecitons, etc. Cornis Blade Manager for drone data is targeted for drone companies as well as OEMs, utilities and ISP having exisiting drone data or already working with drone pilots for the data acquisition. CONTACT US for more information! 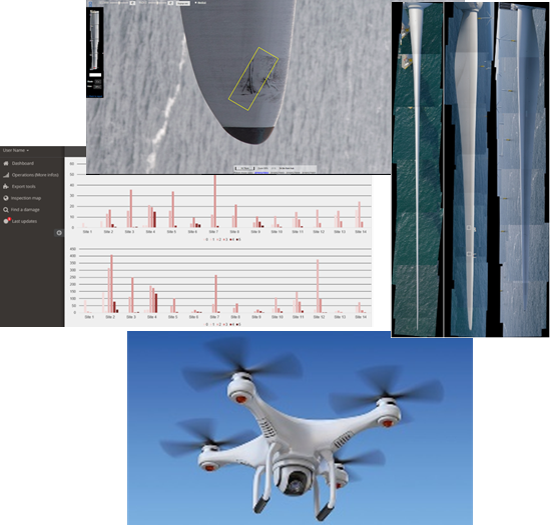 Cornis Blade Manager for drone data: Efficient post processing and reporting to follow blades over time. Si necesita este servicio, puede contactar con el suministrador directamente desde Spares in Motion. Esta empresa es uno de nuestros socios de confianza y ofrece Inspección de las palas, como parte de Servicios de turbina eólica. Si está interesado en esta compañía o tiene alguna pregunta, por favor, contacte con la empresa proveedora a través del botón de contacto disponible.